Perhaps the most beautiful thing about dance is its ability to transcend language barriers – in some way, shape or form, we all speak the language of the body. Think about the things that are unique to your culture. Among those things are language, customs, food, fashion and art – just to name a few. While there are many forms of artistic expression, one of the most unique from culture to culture is dance. Dance can carry with it the history of a people, its stories, traditions, spirituality and religion. Perhaps the most beautiful thing about dance is its ability to transcend language barriers – in some way, shape or form, we all speak the language of the body. And through this language we can access and begin to understand the people and world around us. Another language closely associated with the language of dance is that of rhythm. They can exist simultaneously in the same breath and in the same movement, each lending its power to enhance the other. 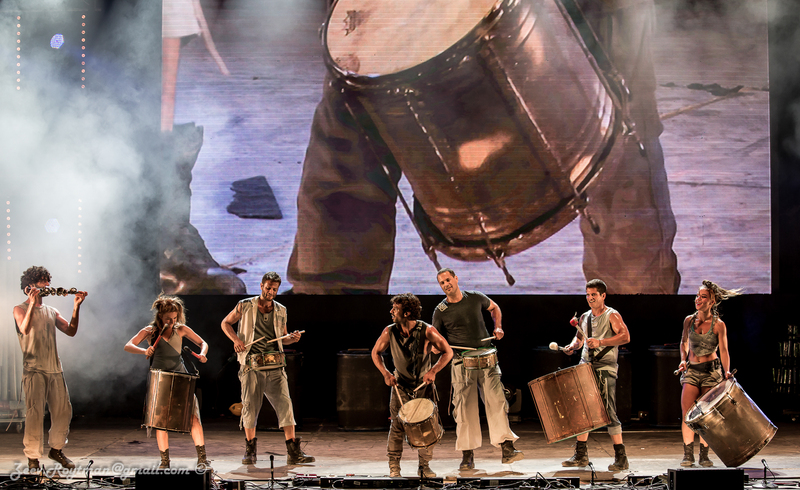 It’s the language of rhythm that the artists at Chicago Human Rhythm Project speak fluently, and with it they have discovered connections and partnerships across the globe – most recently in Tel Aviv, Israel with Mayumana. Kristi Licera: In 2005, Chicago Human Rhythm Project began a concert series called Global Rhythms. This innovative series was the first US program dedicated “exclusively to tap and contemporary percussive arts companies.” For eight consecutive years, CHRP gave Chicago audiences the opportunity to experience rhythmic artists from Japan, Brazil, Israel, Spain, India and Canada as well as US companies presenting a range of cultural dances from Argentina, Mexico and Spain. Can you give us some insight into the importance of exposing US audiences to these international artists, and how bringing Mayumana to Chicago supports the mission and vision of CHRP? Lane Alexander: Rhythm is a universal language – and one of the oldest forms of human expression (I sometimes think we understand each other more easily through non-verbal communication!). Rhythmic expression immediately establishes a shared heritage and, without preaching or being dogmatic, provides a common ground. That idea, that we are more alike than different, is at the core of the Chicago Human Rhythm Project’s mission and all our work. We celebrate our brilliantly unique cultures, but from the perspective that it is a shared human tradition. Thousands of years ago, foot and hand drumming were integral parts of community and sacred rituals. The art we present doesn’t have to be “about” religion or God to be inextricably linked to community and spirituality. It is primal (not “primitive”) so it strikes a deep chord within all of us. Mayumana ties a ribbon around most of the aspects of our work so they were a natural choice for our 30th Anniversary. Lane: The presentation of Mayumana brings two of our programs – one dormant (Global Rhythms) and one very active (Stomping Grounds) – together. Global Rhythms was dedicated to bringing international companies to Chicago to inject their rhythms, perspectives and aesthetics into the city. Stomping Grounds has primarily supported Chicago-based foot drummers and percussionists. Mayumana wraps all of that together in a mixed-percussive arts spectacle that includes tap dance, hip hop, body drumming, hand percussion and more. Mayumana ties a ribbon around most of the aspects of our work so they were a natural choice for our 30th Anniversary. The “cherry on the top” was the fact that they share our mission. Mayumana intentionally uses rhythm to foster reconciliation. Rhythms have echoed around the globe for Millennia as armies, pilgrims, explorers and refugees have brought their cultural practices with them. Lane: But, even before we started presenting Global Rhythms, many of the artists we showcased in our annual tap festival – Rhythm World (you may need a scorecard to keep track of our program names which we’re in the process of streamlining!) – were from abroad and their perspectives on American tap dance were infused with their own cultural rhythmic, conceptual and movement vocabularies. Rhythms have echoed around the globe for Millennia as armies, pilgrims, explorers and refugees have brought their cultural practices with them. African and Irish cultures collided in North America and one of the sparks from that collision was American tap dance. Over at least three centuries, that hybridization continued until there was a new form, neither African nor Irish, but American. Starting in mid- late 19th Century, American tap was exported to other parts of the world through vaudeville, variety and musical theater. The process accelerated exponentially with the advent of the movie and people all over the world began to learn tap dance through the moving pictures. As you mentioned, CHRP has been presenting international artists and global perspectives from day one. What we do is visualize the music. Kristi: Some of the best dancers are those that truly embody the music and rhythms that accompany their movement. These dancers translate the language of music into the language of movement and in doing so, reveal components of the music that you may not have discovered simply through listening. This is especially true for percussive dance artists – having a visual representation of the sounds they move to and the sounds they create adds a different dimension to what you hear. CURRENTS takes this idea to a whole new level by incorporating the talents of their remarkable artists with inventive instrumentation, light and projections. As director and former performer with the company, can you give us some insight into the production and how its elements come together to represent the vision and mission of Mayumana? Boaz Berman: For many years, I was creating works for Mayumana and running to the stage to perform, but it became too difficult at one point as we started to create more complicated pieces with less time. I had to be outside of the work, but I still like to jump on the stage and work with the actors. It’s a natural process for me. What we do is visualize the music. It’s a combination of dance, music, rhythm and theater. Some of the shows we create have a story line; our last show we did in Spain, Rumba, had a story that required the cast to act a lot, sing and dance. This show, CURRENTS, is inspired by the feud between Edison and Tesla, but there is not a direct story. The inspiration is from two forms of energy and when those energies combine, how they create harmony. This show was originally created for a light festival. Doing the show there, we looked for different sources of energy, and found the Edison vs. Tesla story. It was interesting: what is the difference between AC/DC and how do I turn that into movement? In the beginning, we had two groups acting that idea out. The show was just 50 minutes for the festival and we really liked the result. So, we made a whole show out of it and added parts. Our artists are strong individually, but when they synchronize the movement and the rhythm, it becomes music and harmony. Boaz: Each of the cast members is coming from a completely different background. Our dancers have backgrounds in flamenco, ballet, hip hop – very, very different disciplines. When we have auditions, I see many dancers that have technique, but they are missing a connection. Then there are dancers who can tell a story, and they are much stronger. Technique is endless; you will always have those technicians, but the dancers who connect are the best. Our artists are strong individually, but when they synchronize the movement and the rhythm, it becomes music and harmony. That’s the main component of our DNA. What’s synchronized in harmony becomes music. Every movement creates sound, and once the components are synchronized it becomes music. It’s why we explore different music and sounds: with our bodies, with water, with our voices. You can just make sounds, but it’s a different thing to create choreography, harmony and music. For me, the most special part of the show is the water solo. It is the part I was originally doing in the show. We created the solo by bringing a see through-container full of water with a microphone inside. After the solo, this instrument is played with flippers with the choreography. Our main goal is to bring joy. The slogan of the company is “MAYUMANA: The Art of Joy.” Our performers really love what they do and are projecting that. When we see audiences coming out of the show with energy, dancing and singing out of the theater, it keeps our batteries charged. We don’t have any secrets to our show – just do what you want, do it the right way, and do it with passion. Chicago Human Rhythm Project presents Mayumana’s CURRENTS on Wednesday, March 20 at 7:30pm at the Harris Theater for Music and Dance (205 E. Randolph Drive, Chicago, 60601). Tickets are available online at www.harristheaterchicago.org or by calling the Box Office at 312.334.7777 Monday–Friday, 12:00PM–5:00PM. CHRP’s presentation of Mayumana is the kick-off to its its 5th annual Stomping Grounds. For more information on Stomping Grounds including opportunities to view free performances around Chicago, visit chicagotap.org/performances/stomping-grounds.